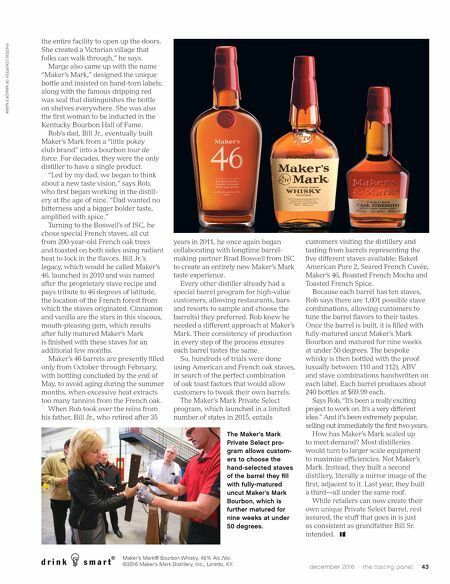 42 / the tasting panel / december 2016 WHISKEY R ob Samuels, COO of Maker's Mark Distillery, isn't just the grandson of the gentleman who burned the old bourbon-making recipe that had been in his family for centuries and charted his own course. He's also the innovator-in-chief at this storied single-ownership distillery in Loretto, Kentucky, who continues to find new ways of delivering the ultimately decadent taste bud–pleasing experi- ence of a bourbon made from single source ingredients, slowly integrated to ensure the essence of smooth. The word "smooth" is as important a part of Samuels's vocabulary as history, tradition and passion. He's a heart-on- the-sleeve advocate for the singular statement that Maker's Mark has made since the first barrel was bottled in 1958, ushering in a new era in bourbon. Rob's predecessors, who hailed from Scotland, made what he calls "pretty awful whisky" in Kentucky for over 100 years until his grandparents, Bill Sr. and Marge, elevated the bourbon experience in the 1950s. Eliminating rye in favor of red winter wheat, the ingredients were processed separately and never pressure-cooked, yielding a smoother whiskey. At the same time, Bill Sr. had the good fortune of meeting J. E. Boswell from the Independent Stave Company (ISC) in Missouri, who discovered that wood left to air-dry in the elements for a year and half instead of being quick- dried in a kiln would result in fewer harsh wood tannins. Additionally, Bill opted out of charcoal chill-filtering, which was common in other bourbons. Instead, the fatty acids that contain so much flavor remain. While Bill Sr. had the taste vision to create something smooth and rich, Samuels credits his grandmother, Marge, with changing the way people experienced bourbon. 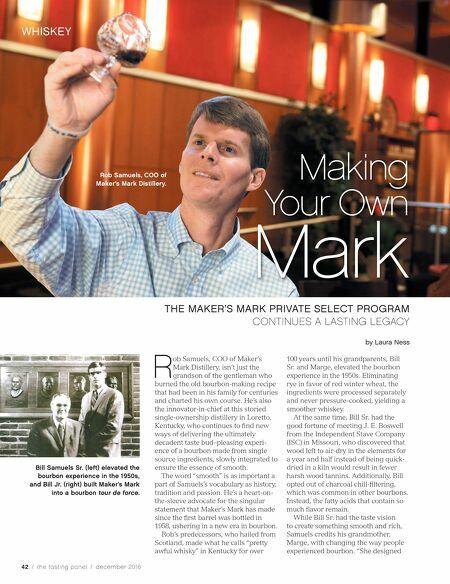 "She designed Making Your Own Mark THE MAKER'S MARK PRIVATE SELECT PROGRAM CONTINUES A LASTING LEGACY by Laura Ness Bill Samuels Sr. (left) elevated the bourbon experience in the 1950s, and Bill Jr. (right) built Maker's Mark into a bourbon tour de force. Rob Samuels, COO of Maker's Mark Distillery.